My previous post on short-selling reminded me of another famous case study of this trading practice - the one that actually happened in the real world on a massive scale - the story of how George Soros, today a world famous philanthropist, broke the Bank of England back in 1992. Or more precisely, how speculators seized the opportunity of a poor British government economic policy decision to make a huge amount of money. Soros was just one of the stock market speculators who earned a bundle from the infamous Black Wednesday in 1992. However, he profited the most. His hedge fund, the Quantum Fund, made a profit of $1.1 billion. The event turned him into one of the most feared figures in finance. What happened on Black Wednesday? To understand that we must first go back in time to explain the 1992 European Monteray System crisis, and in particular the faulty policy applied by the British government. The European Exchange Rate Mechanism (ERM) was introduced in 1979 as a part of the European Monetary System (EMS) with the goal of reducing exchange rate volatility in Europe, thus achieving higher monetary stability. This was basically a prelude to the introduction of the Eurozone in 2000. It was a fixed exchange rate system where exchange rates were allowed to fluctuate between pre-agreed boundaries (2.25% over and under the weighted average of the EMS countries' currencies). The UK didn't enter the ERM until 1990, primarily because of strong opposition to the EMS by Thatcher's government. 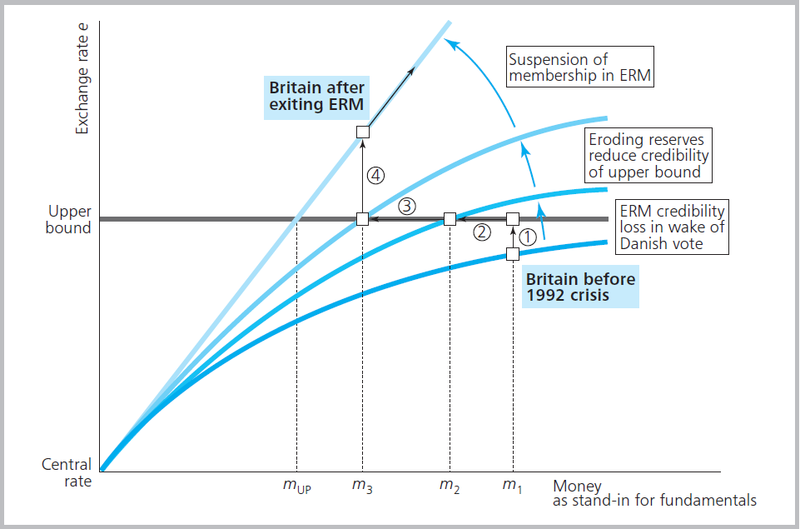 However in 1990 John Major made the decision of joining the ERM with a guarantee that the government will prevent the exchange rate from fluctuating by more than 6% against other members' currencies. Britain entered the ERM with a highly overvalued pound, at 2.95 DEM (Deutsche mark) to GBP. This meant that its currency was worth less against the DEM than what the BoE was trying to hold on to. Much less than the upper bound on the exchange rate (the higher the absolute number of one currency to another, the lower its value). Furthermore, UK's inflation was much higher than the German inflation, implying that entering the ERM at such an overvalued pound rate was a bad idea. Under the relative purchasing power parity condition, higher inflation in one country has to be offset by a depreciating currency in that country. And in Britain, under an overvalued fixed exchange rate for the GBP, this wasn't allowed to happen. In other words, the currency was artificially being kept too high in value. I'll borrow a graph from Manfred Gartner's excellent Macroeconomics textbook to explain this. Before the 1992 crisis, at point 1 in the graph, the upper bound the BoE guaranteed was deemed credible. As the ERM began losing credibility amid the Maastricht Treaty rejection by the Danish referendum voters, and amid the uncertainty around the French referendum, the value of the pound sterling hit its upper bound. The curve represents the exchange rate response line in an exchange rate target zone (basically depicts the reaction of the market forces on currency movements). The persistent loss of credibility by investors in the ERM moved the response line further upwards. Without allowing the exchange rate to adapt to a higher level (depreciate), the BoE had to support the pound by reducing its money supply downwards (from m1 to m3). BoE was lowering the money supply by selling its foreign exchange reserves, thus weakening its own position. This lasted for a few weeks during which Britain was under constant speculative attacks on its currency. It increased the interest rates by 5 percentage points in one day in an attempt to make the pound more attractive and stop the speculators from shorting it. Not until Britain admitted defeat and exited the ERM on September 16th (Black Wednesday) was the pound allowed to depreciate, turning the response line straight (point 4). The pound lost 20% of its value against the DEM withing a day after leaving the ERM. Source: Gartner, M. (2006) Macroeconomics. Prentice Hall, 2nd edition. Chapter 12: "The European Monetary System and Euroland at Work", Pg. 332. For more on the EMR crisis I recommend two great papers, one by Eichengreen and Wyplosz (1993) "The Unstable EMS", and the other by Eichengreen (2000) "The EMS crisis in retrospect". Let's look at the whole story from the speculators' point of view. The Atlantic describes the process via an excerpt from Sebastian Mallaby's book "More Money Than God". I'll paraphrase the story. Amid problems caused by the German unification in which the Bundesbank raised interest rates causing other members of the EMS to suffer a fall in income, the biggest worry for the UK Chancellor at the time, Norman Lamont, was the interview given by the German Bundesbank president Helmut Schlesinger to the WSJ, where according to reports on his remarks (still unpublished) he stated that "there would have to be a broad realignment of Europe's currencies." In Britain this was perceived as a direct attack on the pound calling for its devaluation. Primarily because the investors perceived that as a clear signal that the pound was in fact overvalued. Even more so as Schlesinger's previous public statements triggered an assault on the Italian lira. Soros and his chief portfolio manager Stan Druckenmiller at the Quantum Fund saw these unpublished comments as an opportunity. It was obvious to them that the Bundesbank wasn't going to help the pound remain within its boundaries by cutting the German exchange rate. This meant that a pound depreciation was inevitable and that it was only a matter of time before Britain would exit the ERM. Now it was the time to do some short-selling. Upon receiving this news Soros was reported to say to his portfolio manager "Go for the jugular". And they did. They made a huge bet against the pound, being certain that it would drop. They began the first step of shorting: selling at a high price, limited by the upper bound held by the BoE. They expected Britain exiting the ERM which would allow the pound to depreciate. The rapid fall in value would be their profit margin. When the pound dropped following the depreciation after September 16th, they made the second step of short-selling - the buyback, where they bought back the pound at the lower value to zero their position. The tactic worked brilliantly. In October Soros said in the Times: "Our total position by Black Wednesday had to be worth almost $10 billion. We planned to sell more than that. In fact, when Norman Lamont said just before the devaluation that he would borrow nearly $15 billion to defend sterling, we were amused because that was about how much we wanted to sell." It's a really interesting story of what happened behind the curtain. I encourage you to read it either from The Atlantic excerpt or from the book itself. This short-selling story didn't include any insider information, and was therefore much more legit than the one covered earlier in the movie Trading Places. All it did include was a correct assessment of a bad policy decision from the British government, which was hopelessly trying to fight against the market forces. All you had to do is to be smart enough to recognize it and make a profit out of it. And that's exactly what Soros did.